Area S-1 is the first course of Rainbow Summit and the seventy-fourth course overall in Mario vs. Donkey Kong: Mini-Land Mayhem!. It also introduces the countdown timer mechanic, which automatically activates all of a level's Minis after a countdown. 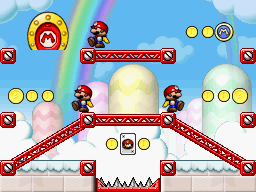 One Mini Mario begins at the top center on a Red Girder platform on the upper level while the other two begin just below it, with the exit door on the top left. In order to reach it, they must simply be guided via a series of Red Girders to it. The Mini Mario Card is located near the bottom center, just above a Spike Trap. The Mini Marios must simply use the Red Girder platform below to reach it. This page was last edited on September 18, 2018, at 06:31.